In June and July of 1999, Bob went on his annual pilgrimage to a distant land; in this case, he went to the Umbria region of Italy for three weeks. While there, he was inspired to try new things in art. This is one of the results. 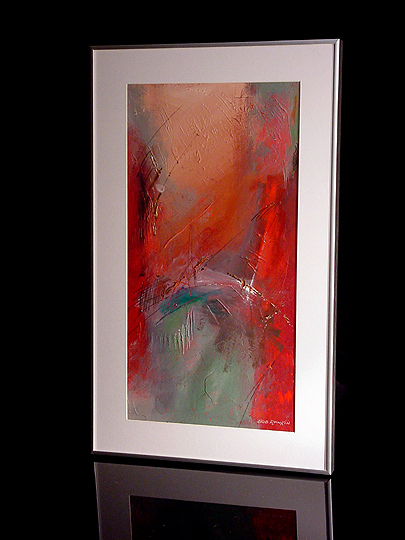 Although Ethereal is similar to many of Bob's earlier abstract works, this work uses a somewhat different color scheme... there's a bit more contrast between warm and cool colors in this work than in his previous works (for example, Big Blue uses cool colors almost exclusively). Also, there are some really nice color gradients in this work... instead of colors "switching" quickly, they transition through lighter and darker values. I really like this effect. How this work was named: Bob and I were looking at it, and I asked him what its name was. He thought for a minute, and said, "Well, it's kind of ethereal..." I said, "That's the name." And there you go.